The personal cooling device market is expected to grow from USD 5.1 million in 2016 to USD 6.9 million by 2022, growing at a CAGR of 5.3% between 2016 and 2022 during the forecast period. Personal cooling devices are energy efficient and less expensive which provide comfort to individuals without disturbing the ambience of other occupants in the room. In the ambient air cooling technology, the cold air is blown by the fans or mini-blower. The handheld devices need very less amount of power for running as compared to room ACs. Thus personal cooling device or handheld device serves as a power efficient cooling system. This power savvy nature of handheld devices is dynamically fueling the demand for personal cooling devices in the current scenario. The base year considered for the study is 2015 and the forecast period is between 2016 and 2022. Handheld cooling device is expected to be the fastest-growing product in personal cooling device market as it is designed in varieties that offer user easy handling with good cooling effect and is easy to operate as compared to other room conditioner. Handheld cooling devices are integrated with TEC modules to provide instant cooling effect. Employees working in hot temperatures use handheld cooling devices to minimize heat/ cold stress and fatigue to improve comfort and productivity. The report identifies market opportunities for stakeholders in the eco-system of personal cooling system. The report includes information regarding the major factors influencing the growth of the market (drivers, restraints, opportunities, and industry-specific challenges), along with the detailed value chain. In addition, the key players are strategically profiled, and their market rank and core competencies are comprehensively analyzed, along with detailing the competitive landscape for market players and describing the new product launches, acquisitions, partnerships, expansions, agreements, contracts, alliances, and collaboration in the market. The report also includes the study of penetration of thermoelectric cooling (TEC) technology in personal cooling system. TEC module is used to attain instant personal cooling effect. Handheld devices integrated with TEC modules are useful for providing cooling effect to patients suffering from hot flashes, migraine symptoms, insect bites and sports injuries. 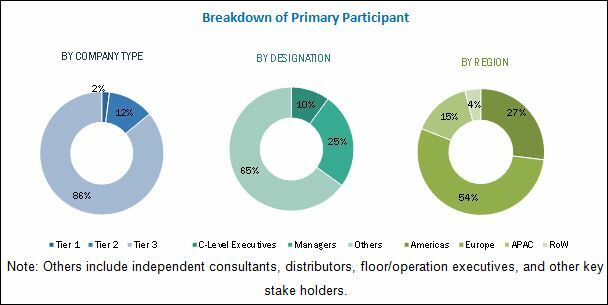 During this research study, major players operating in the managed print services market in various regions have been identified, and their offerings, regional presence, and distribution channels have been analyzed through in-depth discussions. Top-down and bottom-up approaches have been used to determine the overall market size. Sizes of the other individual markets have been estimated using the percentage splits obtained through secondary sources such as Hoovers, Bloomberg BusinessWeek, and Factiva, along with primary respondents. The entire procedure includes the study of the annual and financial reports of the top market players and extensive interviews with industry experts such as CEOs, VPs, directors, and marketing executives for key insights (both qualitative and quantitative) pertaining to the market. The figure below shows the breakdown of the primaries on the basis of the company type, designation, and region considered during the research study. The global personal cooling device market includes manufacturers of handheld cooling device, such as AMBIENT Therapeutics Inc. (U.S.), Lakeland Ltd. (U.K.), Beijing Huimao Cooling Equipment Co. Ltd. (China), Handy Cooler (Genexus LLC) (U.S.), and Design Go Ltd. (U.K.); personal air conditioners and desk fans manufacturer, such as Honeywell International (U.S.), Havells India Ltd. (India), O2Cool LLC. (U.S.), Holmes (Jarden Consumer Solution) (U.S.), and Evapolar Ltd. (Russia); research institutes & universities, alliances & associations of personal cooling/ thermal cooling technologies, and end users of personal cooling devices. In May 2015, Honeywell introduced new products in QuietSet® and Turbo® product line: Turbo® on the Go! and QuietSet® Slim Mini Tower Table Fan respectively. Turbo® on the Go! is portable folding fan that can be USB and battery operated. This fan can be used in office, gym, on beach, or during camping, backyard barbeques and picnics. In September 2015, Evapolar Ltd developed a world`s first personal air conditioner "Evapolar" that offers 3 in1 functionality of cooling, humidifying, and air purifying. The device is completely eco-friendly and is 12 times more energy efficient that current air conditioners. Based on patented nano-technology this device is unique and easy to use. In February 2016, Havells India Limited expanded geographically through its retail showroom 'Havells Galaxy'. The new office offered the customers the complete electrical solution. The wide range of solution offered comprise Industrial Switchgears, Cables, Fans, CFLs, Lighting Fixtures, Electrical water heaters, Crabtree switches and Domestic Appliances, etc. This expansion also generated an opportunity for the growth of personal fan and personal coolers. Note1: RoW includes the Middle East and Africa. What are new technologies which the personal cooling device providers are exploring? The personal cooling device market is expected to grow from USD 5.1 million in 2016 to USD 6.9 million by 2022, growing at a CAGR of 5.3% between 2016 and 2022 during the forecast period. The rising temperature, comfortable personal cooling, device user friendliness, and energy saving technologies are the major factors driving the growth of this market. Personal cooling devices are energy efficient and less expensive which provide comfort to individuals without disturbing the ambience of other occupants in the room. In the ambient air cooling technology, the cold air is blown by the fans or mini-blower. The handheld devices need very less amount of power for running as compared to room ACs. Thus personal cooling device or handheld device serves as a power efficient cooling system. This power savvy nature of handheld devices is dynamically fueling the demand for personal cooling devices in the current scenario. This report covers the personal cooling device market based on product, into air conditioner/ desk fan and handheld cooling device. Handheld cooling device is expected to be the fastest-growing product in personal cooling device market as it is designed in varieties that offer user easy handling with good cooling effect and is easy to operate as compared to other room conditioner. Handheld cooling devices are integrated with TEC modules to provide instant cooling effect. Employees working in hot temperatures use handheld cooling devices to minimize heat/ cold stress and fatigue to improve comfort and productivity. The market for handheld cooling device in APAC is expected to grow at the highest CAGR during the forecast period. The countries such as China, Japan, Australia, South-Korea, and India in APAC region consumes more personal cooling devices as compared to other region in the world. China is the largest producer and supplier of low-cost personal cooling devices with variety of features. Owing to this personal cooling devices market is very fragmented. The hot climate of the APAC region and increase in global warming is the main reason for rise in temperature in the region. Thus, there is great opportunity for personal cooling device to increase its market presence in China and adjacent countries. Motorcycle air conditioner is one of the emerging application of personal air conditioning technology. The system blows cold or hot air inside the wearable jacket, thus provides a comfortable environment to the rider. Moreover many people use personal cooling fans in their vehicle to get comfort from environmental heat. Such comfort minimizes fatigue while riding, resulting in improved alertness and concentration of the rider. What are the key upcoming technology in personal cooling device market? What are the major regions where personal cooling device market is growing? HVAC systems are major substitutes for personal cooling devices as these systems provide both cooling and heating for personal comfort. The HVAC systems have more adoptability as compared to personal cooling device. As a result, this would restrain the personal cooling device market. Battery operated personal cooling devices drain out their batteries faster. These batteries need repetitive replacement, which is an annoying process for end users while using these devices at stadium, beach, travelling, and so on. Thus, there is a limitation to the running time of the device. However, the technology advancement in battery capacity will reduce the impact of this factor over the market in future. Availability of less branded product is also one of the factors restraining the personal cooling device market growth. The major companies in the personal cooling device market include Havells India Ltd. (India), Honeywell International (U.S.), O2Cool LLC (U.S.), Ambient Therapeutics (U.S.), Evapolar Ltd. (Russia), and others. These players adopted various strategies such as new product developments, and business expansion to cater to the needs of the personal cooling device market. 10.12 Shenzhen KRG Electronics Co. Ltd.